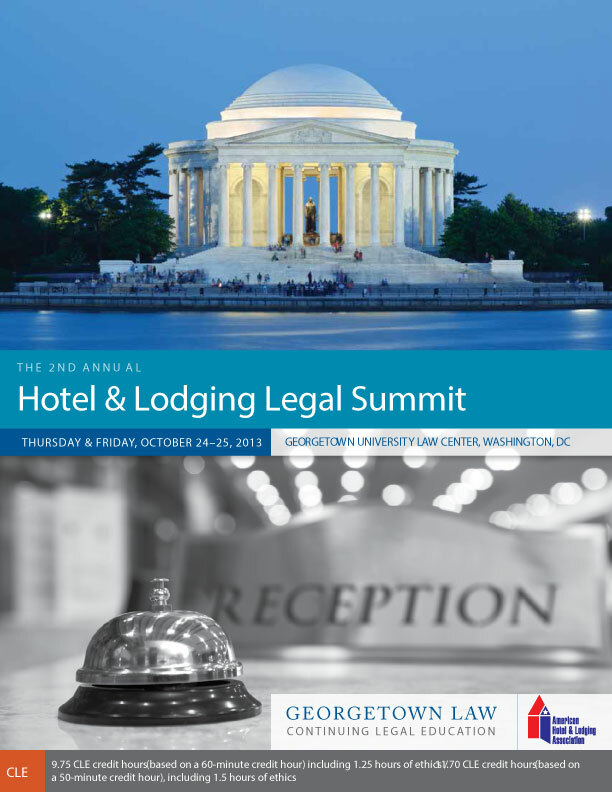 Last October, it was again my privilege to co-chair the Hotel & Lodging Legal Summit, co-sponsored by Georgetown University Law Center and the American Hotel & Lodging Association (AHLA). Over 200 attorneys attended this event. The conference featured many prominent attorneys within the hotel and lodging industry, including (among the speakers) the General Counsels of Carlson Rezidor Hotel Group, Choice Hotels International, Inc., Fairmont Raffles Hotels International, FelCor Lodging Trust, Strategic Hotels & Resorts, Inc. and AHLA. Other hotel and lodging companies represented among the speakers included Commune Hotels & Resorts, Hilton Worldwide, Inc., Hyatt Hotels Corporation, Host Hotels & Resorts, Inc., Marriott International, Inc. and La Quinta Inns and Suites. Speakers also included several attorneys with private practices focused on the industry as well as non-legal professionals in the industry. An attorney with the U.S. Federal Trade Commission spoke on one of the panels. Unique highlights of this conference included a discussion of legal issues confronting the timeshare industry, which included panelists from the Orlando-based legal departments Hilton Grand Vacations, Company, LLC, Marriott Vacations Worldwide, Corp. and Wyndham Vacation Resorts, Inc. The conference also included a discussion of legal ethics. Jared Garner, of Carlson Rezidor Hotel Group, led that discussion, which included input of panelists as well as audience members, who voted on hypothetical questions using their smartphones, with software instantly tallying the results and posting them on a screen. For the first time, we also had a lunch speaker, Roger Dow, the President & CEO of the Washington, D.C.-based U.S. Travel Association. Mr. Dow discussed successful efforts made by the industry and the federal government to facilitate and increase travel to the United States from other countries. The most significant constructive feedback we received from the 2013 conference was that we needed to increase our efforts to ensure balanced representation of different segments of the hotel and lodging industry in discussions of legal issues that affect these segments differently. These segments include owners, operators (including both branded independent management companies), franchisors and franchisees (both large and small). We have made a concerted effort to do this for the 2014 Hotel & Lodging Legal Summit, which I will address in a blog post on that conference. I am grateful to all of the professionals who contributed to the success of our 2013 conference.